When you listen, you are giving your full attention to something or someone who is making a sound. Are you interested in becoming an active listener who can so deeply listen that your coworkers and staff feel fortunate to have you as a colleague? You can with deliberate practice and more experience. In deep, or active listening, which are words used to describe the most effective listening styles, the listener exhibits certain powerful listening behaviors. When you give your undivided attention to another person or activity, you are deeply listening to whatever they are attempting to communicate. This listening is perceived by the other person as respectful and caring. This listening is also perceived, by the person you are listening to, as evidence that you are really hearing and understanding what the person is trying to communicate. You'll want to learn to actively and deeply listen because these skills will help you become an effective business communicator. You can't become a great verbal communicator without the second half of the listening equation, active listening, strongly embraced. In active listening, the person who is the listener, conveys to the person whom he or she is listening to, their deepest respect. This is conveyed through a serious effort to focus in on and concentrate on the words and the meaning that the person who is communicating with them, is trying to convey. The listener asks questions that probe and focus on understanding and clarifying the meaning of what the communicator is trying to convey. The listener does not spend the time formulating an answer or response to the speaker's communication in their minds while the other person is speaking to them. The listener focuses his or her mind and full attention on the words and meaning of the person communicating as observed and heard through such components of speaking as their words, the tone of voice, nonverbal facial expressions and body language, examples, and speaking speed. 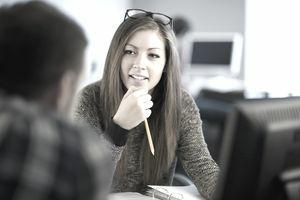 In active listening, the listener provides to the person attempting to communicate, affirming body language, murmured agreement words, and other sounds and actions that help the person communicating feel heard out and listened to. For example, you can nod your head, smile, say "yes, I understand," and use other methods of providing feedback as you listen. It is easy to fall into bad listening habits in the daily busy that you experience at work. Casual conversations and interaction with your every day coworkers can lead to an informality that doesn't support active listening. These are the common listening bad habits that will prevent you from becoming the most effective communicator. If an employee repeatedly raises the same issues or points of view to you, as an active listener, the fundamental problem to consider is that the employee is repeating himself because he doesn't feel you are hearing him. Take a look at your active listening habits to see if you are exhibiting the needed listening behaviors that will communicate to the employee that you really are listening—and hearing and understanding him. Don't try to pay partial attention to a colleague or staff member. You insult the person and you will never fully comprehend their position or need. When an employee or coworker approaches you for advice, inspiration, feedback or a discussion, listen to understand what the individual needs from you. If you can't fully attend to the staff person at that minute for any reason, it is better to reschedule the conversation. If you are, for example, on your way to a meeting, struggling with a deadline, trying to leave early, or experiencing any other distraction, it is better to make an appointment when you can really listen to the person. In the worst case scenario, if you only partially listen, the employee walks away feeling that you don't care about his or her concerns. It is far better to reschedule the discussion when you have time to listen with your active and deep attention. Say, "Tom, I'm really distracted by my 3 p.m. deadline on the current project. Can we get together tomorrow morning at 9 so that I can listen and fully understand your concerns?" Listen with your full attention directed toward understanding what your coworker or staff member needs from you. Many managers, especially, are so used to helping people solve problems that their first course of action is to begin brainstorming solutions and giving advice. Maybe the employee just needs a listening ear. Your best approach is to listen actively and deeply. Ask questions for clarification to make sure that you understand exactly what the employee is trying to communicate. When you believe you do, then, and only then, ask the person what they would like from you. Trust this. They usually know, and often, they breathe a sigh of relief and say, "Thank you so much for just listening. It is exactly what I needed. I don't need you to do anything else." You can become a more effective active listener if you pay attention to these main bad listening habits. With repeated practice, you can eliminate your bad habits and become a great active listener. These changes will make you an effective business communicator. Your colleagues and reporting staff members will benefit from your deliberate practice.